My room is still a mess but I was able to make this very simple card tonight. I used the round shapes on the magazine page for my inspiration as well as the background color. The snowflakes are glittery but it's hard to tell from the picture. Also I just got this new lens (today) and I'm still getting used to it. I forgot to switch my ISO after I had been doing some playing so it's a bit grainy. This proves that no matter how good or expensive your lens is, you might still take crappy pictures because you're just a bad photographer. lol. Anyway the cardstock is Stampin' Up Baja Blue, patterned paper from Imaginisce, ink is Stampin Up Whisper White, OLD heat and stick embossing powder from somewhere, Stampin' Up Dazzling Diamonds glitter, white Paper Trey Ink cardstock, Cuttlebug embossing folder (snowflakes), Stampin' Up circle punches. This is oh so pretty! And yes you definitely NEED the Top Note Die! Oh My This is totally Elegant looking...Love the paper snowman papers and the cuttlebug folder and your snowflakes are just so perfect!!!! Stunning Card!!!! Great card for the challenge. Love you take on it. The snowmen look so cute. I love, love, love this Gale!! It is so pretty- maybe simple to make but not simple in style. Gorgeous! Very cute card. I havn't had a chance to play yet, but I will try to do it today. 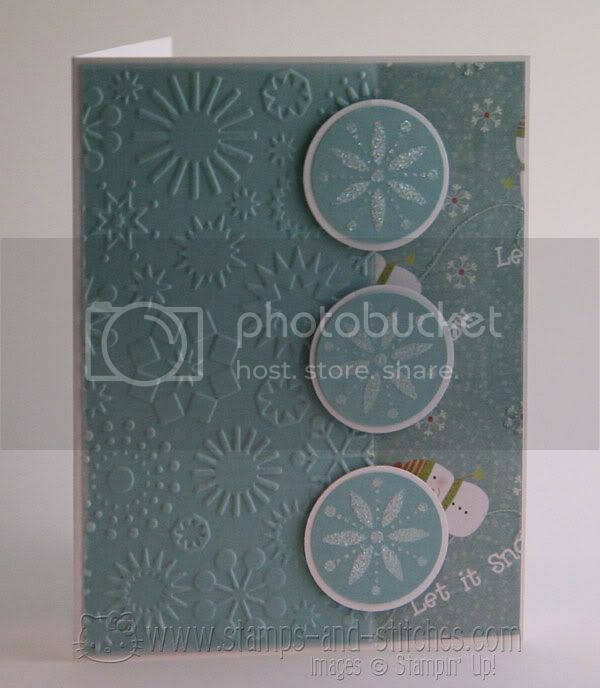 Adorable card - love the circles and color used. I have seen that pattern paper yet, but it's cute! Great card Gale - love the embossing and the circle elements -perfect from the inspiration piece! love the colors too - very soft and wintery! Great card! I love the blue snowflakes. I can't wait to work on the challenge now that my finals are over.